I was a little surprised TSTL did not disclose an expected first-half revenue figure within today’s AGM statement. AGM updates for both 2014 and 2013 contained such numbers and its absence this time around may indicate the top-line did not perform as well as management had hoped. Nonetheless, it appears pre-tax profit (before share-based payments) for H1 will improve by at least £0.3m — a substantial 27%-plus — to not less than £1.4m. So I presume there was indeed a notable top-line advance. As such, I wonder if there is scope for TSTL to surpass the City forecast for the full year. I noted in my last Blog post that TSTL had ‘sandbagged’ previous trading statements and that the last annual report contained ‘one offs’ of £200k that depressed reported earnings. 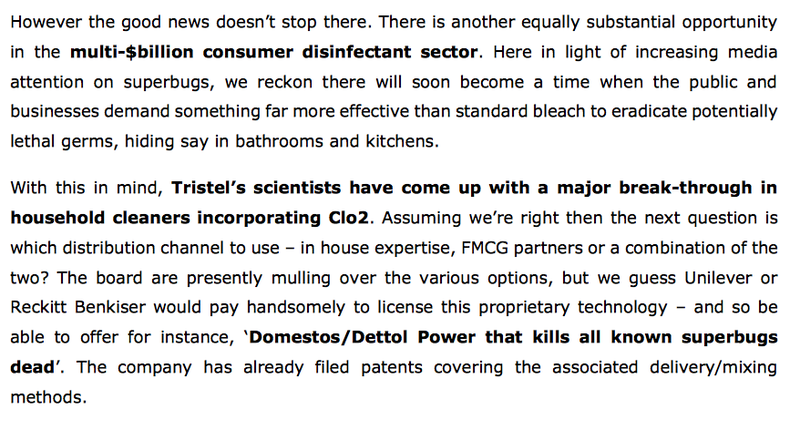 As far as I can recall, TSTL has never really highlighted its range of domestic products — possibly because the directors have been too busy managing the ups and downs experienced by the firm’s main hospital disinfectants. However, with the business presently on a stable footing, I dare say re-evaluating products for the home now makes sense. Naturally I have no idea whether a handsome licensing deal with a FTSE multinational is in the offing — but I shall keep my fingers crossed! With pre-tax profit running at £2.9m and tax applied at a standard 20%, I reckon current earnings could be around 5.5p per share. Taking surplus net cash to be £2.8m or 7p per share, my estimate of TSTL’s enterprise value is £58m or 138p per share. Dividing that 138p by my 5.5p earnings guess gives a trailing cash-adjusted P/E of 25. I wrote in October that, using TSTL’s 2017 targets of £20m revenue and at least 15% margins (and again applying a standard 20% UK tax rate), earnings could be at least 5.8p per share within two years. 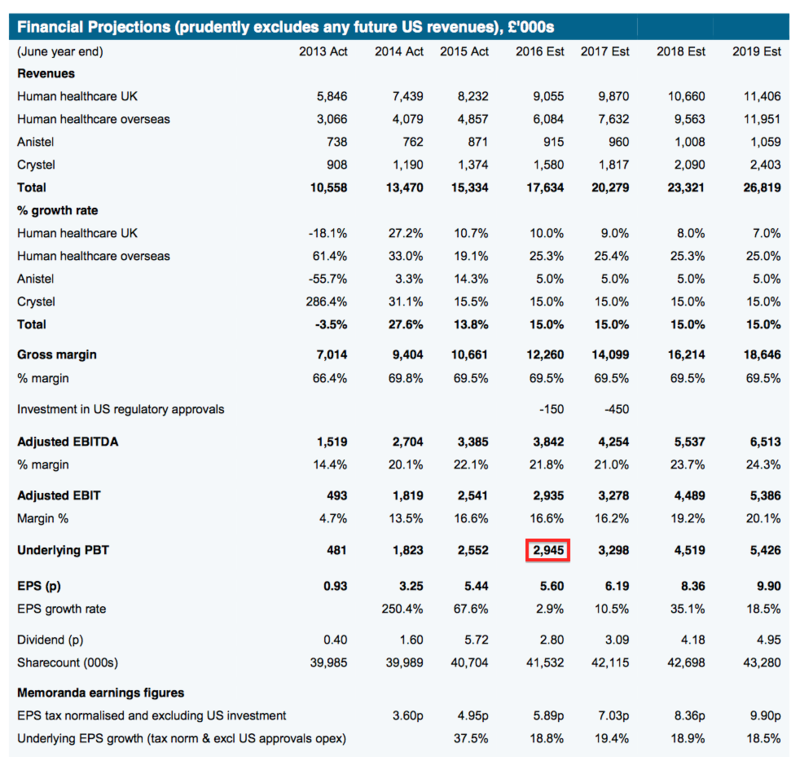 I must admit, that 5.8p projection is now looking a tad pessimistic given the group’s current profitability. Whatever TSTL’s 2017 earnings turn out to be, it’s clear the current share price is expecting a fair amount of future profit growth. No doubt the potential for revenue (one day) from the US, plus speculation involving Reckitt Benckiser and Unilever, is helping to excite investors right now. All told, I am happy to hold TSTL but I must admit some nerves given the share has grown to become 18% of my portfolio. I suspect I may have to top-slice this holding in time as and when I want to reinvest in bargains elsewhere. Next events — 2.135p final dividend to be paid on 18 December, interim results to be published 24 February 2016. 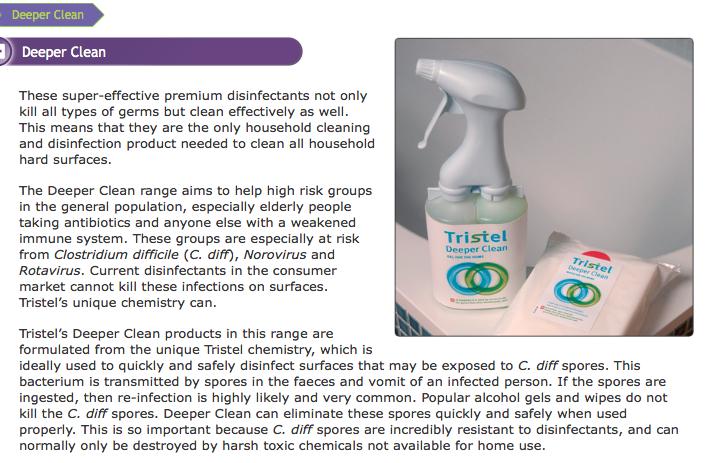 Tristel plc (AIM: TSTL), the manufacturer of infection prevention, contamination control and hygiene products, announces that it is to build upon the success of its German operation by upgrading its branch to subsidiary status (GmbH). The branch, established in 2010 and based in Berlin, has made significant progress in penetrating the German hospital market in the areas of ear, nose and throat; cardiology; urology and ultrasound. From a single employee start up with sales of £50,000 in 2010-11, the branch recorded sales of £1.4 million in Tristel’s last financial year ended 30 June 2015, and now has an eight strong sales team. The branch sells the Company’s wipes and foams to the same hospital departments that Tristel targets worldwide and counts 80% of Germany’s university hospitals amongst its customers. During the past two years the branch has taken responsibility for developing the Swiss and Austrian markets and has done so successfully. Paul Swinney, CEO, comments: “We are very pleased with the platform that we have built in Germany. The progress that we have made in Europe’s largest hospital market is evident in the fact that Germany’s contribution to Group worldwide sales is now approaching 10%. However, there is still enormous potential to exploit if the level of our German sales is to match the United Kingdom’s. “It is, therefore, an appropriate moment for us to upgrade the status of the branch and also extend its sphere of responsibility. Whilst we have some limited activity in Poland we have no representation or sales in Hungary, Slovakia, Czech Republic, Slovenia or the Ukraine. The Berlin team will now use their linguistic and cultural ties, and physical proximity, to develop the wider Central European market whilst continuing to grow domestic German sales. I’m not clear on the branch to subsidiary change either. At present the German sales are lumped in (I think) with other overseas sales in a domestic subsidiary called Tristel International Limited. Now they’ll be accounted for within a new German subsidiary, similar to TSTL’s existing New Zealand division. I suppose as the German operation has grown, it now requires greater/different administration and as mentioned, what will now become a German employer may be more amenable to German employees. What the cost benefits of all this are I am not sure. Sales per Germany’s 8 sales staff come to £175k, which contrasts to £454k from the wider group’s 33 sales staff in 2015. So the Germans do have scope to increase their productivity.